Everyone loves to make money online. Today you will learn how to earn 50 rupees from IRCTC online instantly. So, are you ready to get 50 rupees in your account? As you all know the Indian Railways Catering and Tourism Corporation is the official railway organisation that is responsible for dispersing railway tickets in India. Apart from railway tickets, they also provide food and catering facilities to its customers, and also run various lounges and guest houses. But that is not it, IRCTC also can make you rich sometimes by the way of various offers and schemes. Now, let's get back to earning money i.e. 50 rupees. It's really interesting. IRCTC has come up with 'scan and pay' scheme. Under this scheme those customers who have a Visa Card i.e. Credit card/ Debit card can scan their cards online using any of the official IRCTC apps and make payment. Best thing is you don't have to enter any promocode to avail the offer. And there is no limit on how many times you can get cashback. When customer pay for railway ticket booking using Visa scan and pay feature, they will receive Rs 50 cashback in their account. Most times money comes instantly, but one can wait for 30 days in some cases. This scheme is valid till September 4th 2017 or until first 5,00,000 (5 lakh) mVisa transactions are done. So hurry, and don't miss this opportunity to make some handsome money. 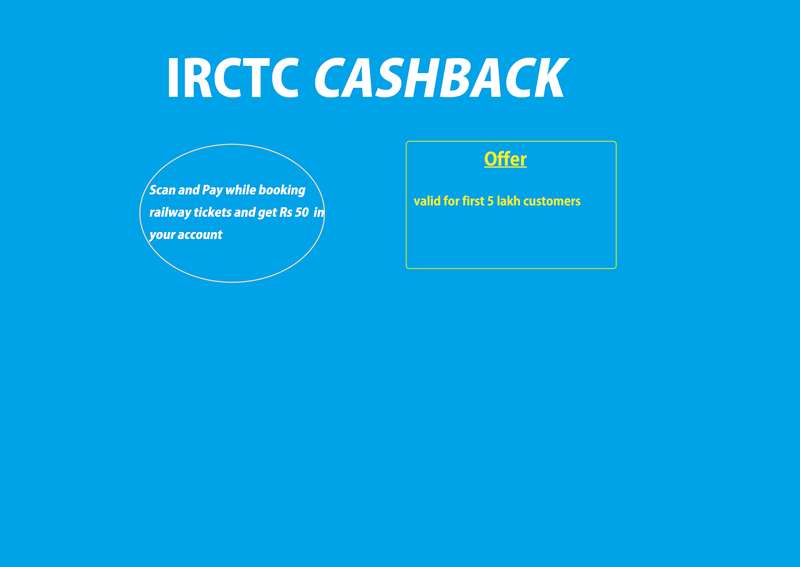 To more information on IRCTCs mVisa_Offer and its terms and conditions, download irctc VisaCashback pdf.